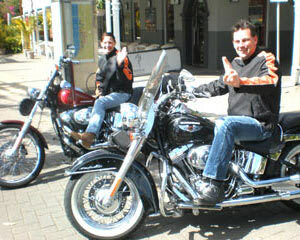 Try One Of Our Harley Rides And Cruise In High Style At Adrenaline! Talk a joyride on the wild side and experience Great Ocean Road scenery and everywhere else with a Harley-Davidson experience. 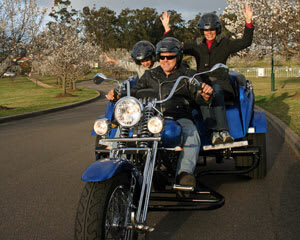 There’s nothing quite like reclining in full-throttle, cruising style as you absorb the visual splendours of this heritage-listed Victorian coastal route, the Dandenong Ranges, Mornington Peninsula wine region, sights of Melbourne and the most scenic routes throughout Australia, while sitting atop a Harley or partaking in a sidecar tour. 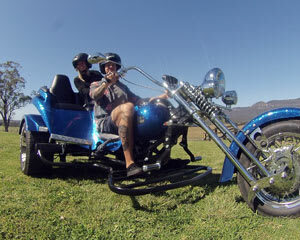 Adrenaline puts these unmatched two-wheel deals within reach with a range of Harley ride experiences for passenger-seat road tours or learn how to ride a Harley Davidson packages. 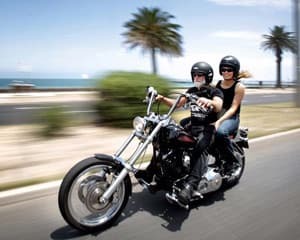 For a test ride to floor you and ignite your sensory engine, the Harley Davidson Ride 2 Hours Melbourne – Mornington Peninsula puts quality and quantity at your command. 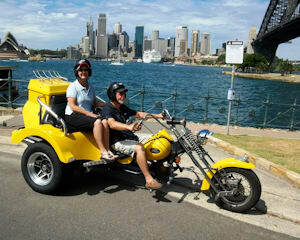 Two full hours of cruising potential atop one of these dream machines is paradise found for Harley devotees. Your rider will arrive to collect you from Frankston Station at a designated time. You’ll be suited up in all-inclusive riding gear before taking to the road in your mint-condition Harley Davidson. 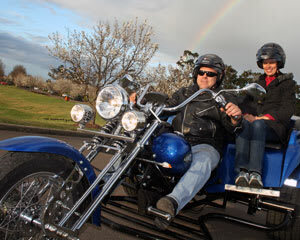 Sit back and enjoy the ride, as you tour through the Port Phillip Bay region, Arthur’s Seat before stopping for a beer or latte at the Arthur’s Seat Hotel. Soak up the spectacular views as you sip and absorb the unforgettable experience. Your return journey will see you ride through the lush wine region of Red Hill and back to base point. Other pickup points can also be arranged at an additional fee. 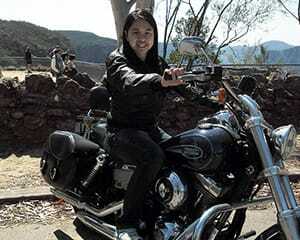 Is it easy to ride a Harley? Despite the range in centre of gravity of various Harley Davidson models, learning to ride a Harley is no easier or harder to master than any other motorbike. You’re perched up high on some Harleys and lower to the ground on others, so each present their own unique control, steering and stopping sensations. Try one on for size and see which model best suits your comfort zone, riding style and particular scenic view of the world around you. What's the best Harley for a beginner? Start small and work your way up to the big daddy of Harleys: the FXDR 114, with its whopping 1868cc engine. 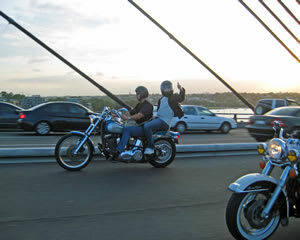 When learning to ride a Harley-Davidson motorcycle, first timers should opt for a smaller, lightweight bike, such as the Harley-Davidson Super Low XL883L or Harley-Davidson Street 750 models. They’ve got the classic good looks and manoeuvrability of your larger-style Harleys, but are easier to handle on the main thoroughfares and winding roads. What age can you ride a Harley Davidson? You’re limited only by the need for speed and spirit of adventure if you yearn for the adrenaline-charged cruise mode of a Harley Davidson ride. 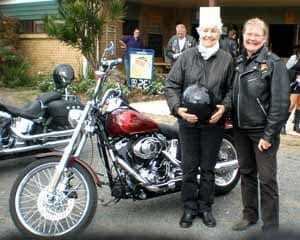 There are no age restrictions for any Harley tours offered at Adrenaline. 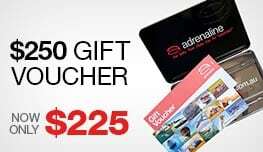 You can purchase a Harley Davidson joyride experience online or an Adrenaline gift voucher for redeeming the wide range of Harley Davidson cruising packages. 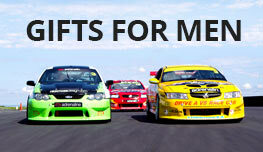 Vouchers are valid for three years, can be emailed to the recipient or even arranged to arrive in style: inside a brushed-metal gift box, which, incidentally, is an Adrenaline trademark touch.